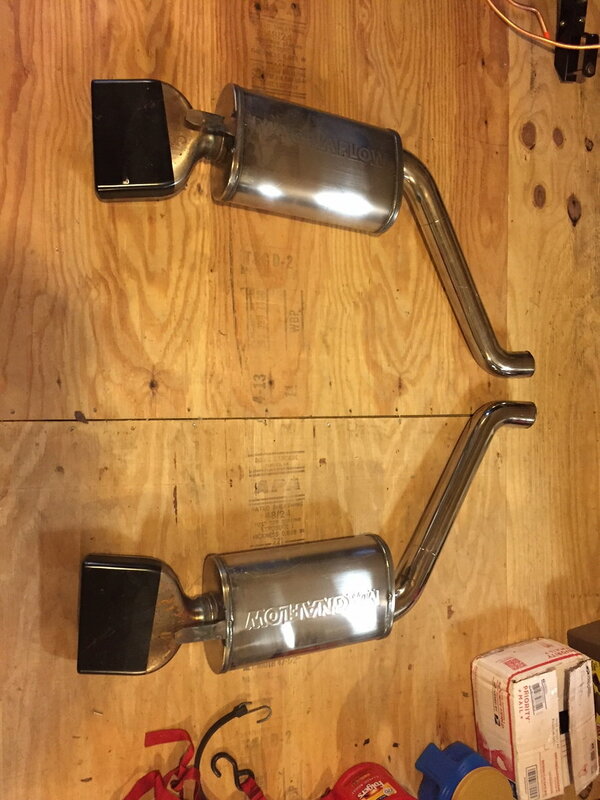 Low mileage Magnaflow mufflers with LT style tips taken off a 1990. 2-1/2" inlets. These were part of a custom exhaust and may require some tweaking to fit a stock system. $100 for the pair to pick up or can meet near NW PA, East WV or in between. Last edited by TimV SR; 04-27-2018 at 07:10 AM. Not worth the time and money to ship. Would they fit on a 95? These are still available. If I can ship them I have two people interested, but I prefer a local (16335) sale. Again, I can meet a buyer along the east end of PA, Erie, PA area, Pittsburgh to Somerset areas, Cumberland Maryland area, and south of Cumberland in West Virginia. Well Ok I am in Houston and I will take these . I tell you what if you will ship ship go back from the back of the muffler 12" cut the pipe will be way better and easer to box and ship .. I don't need the extra pipe .. I just need the mufflers and enough pipe to tie my exhaust in to 12" should be fine if you want to do that if so just let me know shipping to 77459 .. Done deal .. Hear is the deal I an leavening for N. GA , in the morning and don't know if I will have internet access will be back next Sun.. anyway if you want to do the cutting and the shipping just give me a call just give me a call is better no big deal .. C-256-328-0005 Mike .. We can figure it out .. .. .. Thanks ..